The Shipping Cabin is architect Keith Dewey’s answer to prefabricated modular homes. He proposes fitting old shipping containers with all the comforts of home in a factory, then shipping the finished units all over the world. 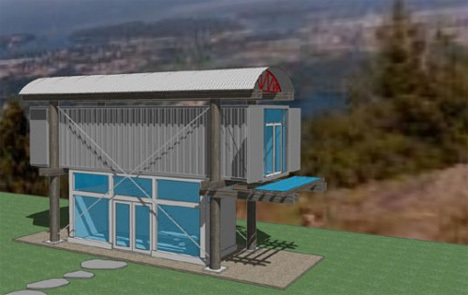 This design consists of one container atop a glass and aluminum ground-floor structure. It’s small, but effective for a weekend getaway or summer retreat for a single person or a couple.